SMC Global is one of the largest full services broker based out of New Delhi. 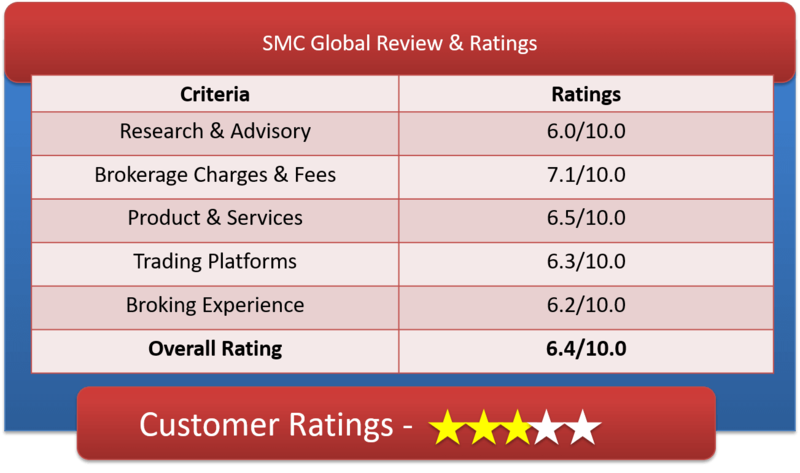 Lets have a detailed review of SMC Online Demat Account, SMC Global Brokerage Charges, SMC Trade Online Trading Platforms & other important features. SMC Global or SMC Online or SMC Tradeonline is offering services in stock, commodity and currency broking. Apart from this they are also offering investment banking, wealth management, distribution of third party fin products, research, financing, depository services, insurance broking, clearing services. SMC Global also helps you with real estate advisory services (mainly to corporate, institutional, high net worth individuals and other retail clients). Online Stock Trading is a new endeavor of SMC Global. SMC Global by having tie-up with Punjab National Bank is providing share trading facility to its clients. SMCtradeonline.com and SMCindiaonline.com is the way out for all the information related to the broker. The Broker got awarded as Best Commodity Broker, Best Currency Broker, Best Research analyst for Equity, IPO and Commodity. You can do online trading in Equities, Derivatives, Currency, Commodities, IPOs, MF and Bonds with SMC Global. SMC have an excellent team of Research Analysts and Advisory Managers to help you with strategies for equity and derivatives investment. The team also provides valuable recommendations for trading on futures & options segment. Customer care is taken into account via email, phone, toll free no and SMS. They have one of the largest distribution network in the country. SMC Global boasts of having a network of 61 branches. Their branches include overseas office at Dubai and more than 2,290 registered sub-brokers and authorized persons with presence in regional India and over 550 cities. SMC Online claims to have competitive brokerage rates but they prefer to serve on one to one basis depending upon your volume traded and bargain quality. This broking house serve their clients personally as they have branches and sub-brokers office available across the country. How to Open SMC Global Demat Account? Why Open SMC Online Demat Account? Invest online in IPOs, Mutual Funds, GOI Bonds all from one website. General Insurance (non life) is also available. This full service broking house supports Web based, software based and mobile App based trading Platforms for their clients. SMC Global’s trading platforms performs well in terms of speed, convenience and risk management. Latest news, market information and research reports on email. Another web-based trading platform with live streaming quotes, This account is ideal for Active traders who transact frequently and in large volume during day’s trading session to capitalize on intra-day price movements. A software-based platform for active traders. It comes with features like Real time streaming quotes, intraday charting, Multiple Exchanges on a single screen. It also has Fully Customizable Market Watch, Track Multiple Stocks on single screen, Hot Key Functions etc. It is the application based user friendly interface for trading across Equity and Commodity. It provides real time access to market information like Script Info, Contract info and Best Five. Mobitrade is available in two modes, Lite which is refresh based and Streaming which provides continuous streaming quotes. SMC mobitrade is available on BSE, MCX Commodity & NCDEX but not on NSE. This is the app designed for I-pads and Android phones and tablets for trading in NSE Cash, NSE F&O, BSE Cash, BSE F&O, MCX, NCDEX & NSE Currency. Other feature remains more or less same as SMC Mobitrade. SMC Global offerings are no less no more but just right. The Broker has something extra to offer on almost all trading segments. The Brokers need to me more transparent in terms of brokerage and other charges. Clients can place AMO and BTST (Buy Today Sell tomorrow) order options are available too. Good Till Cancelled (GTC) as well as Good Till Date/Time (GTD) Orders options are not available in equity segment.